Transform your home with the idyllic fragrance of rare Polynesian orchids, tropical lotus flowers and hibiscus in the purest natural wax candle. 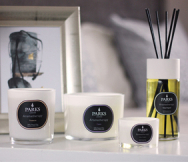 For more than 20 years, Parks London candles have been renowned the world over for their purity and quality. Made entirely from natural waxes, soot-free wicks and the finest essential oils, no other scented candle gives you a cleaner burn or truer, longer-lasting fragrance to complete your home.